Special Needs Baby: Should babies with Trisomy 18 be treated? Should babies with Trisomy 18 be treated? 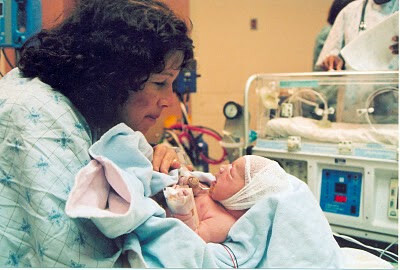 Many of you remember our interview with Barb Farlow, who lost her baby daughter Annie (above), who had Trisomy 13, after she was rushed to hospital in respiratory distress. Barb later read Annie's medical records and learned a "not for intubation" order had been written without consent. This month Barb co-authors a fascinating article in Pediatrics -- the official journal of the American Academy of Pediatrics -- that address the ethics of offering heart surgery to the parents of a baby with Trisomy 18. Most children born with the condition die in the first year of life. In An Infant with Trisomy 18 and a Ventricular Septal Defect, Barb and two North American neonatologists respond to questions about whether heart surgery should be offered and, after a surgery results in complications and the child can't be extubated, whether life support should be withdrawn over the objections of his parents. Cases of trisomy 13 or 18 highlight an area of deep disagreement. Most parents would not want an infant with these conditions. Many of them are grateful for the prenatal diagnosis that allows them to terminate an affected pregnancy. Others choose a different course and either forego prenatal diagnosis, or, as in this case, use the information to make decisions about obstectric and neonatal care. Doctors are similarly deeply divided; some feels that aggressive treatment is futile and should not be offered, and others defer to parents. Drs. Okah and Janvier reflect this professional disagreement. Ms. Farlow speaks for the parents who come down on the side of treatment. These cases raise the most fundamental questions about the value of life, the meaning of personhood, and the limits of parental and professional authority. Deference to parents is generally the right course unless the infant is clearly suffering from ongoing treatment that is unlikely to be of benefit. The doctors in this case did the right thing: they worked to find common ground. As often happens, the infant surprised everybody.